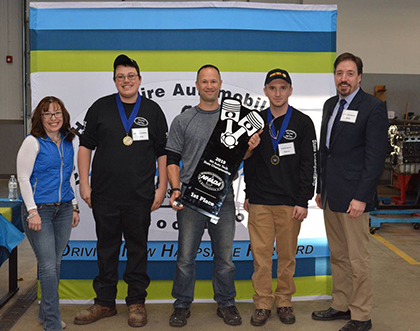 A team from Portsmouth High School won the Automotive Tech State Championship held at Lakes Region Community College in Laconia. The team, which was the fastest to complete multiple stations with different makes and models of cars they had to repair, will continue on to the national competition in New York. The top winners received thousands of dollars in scholarships from the New Hampshire Automobile Dealers Association to enroll in the Community College System of New Hampshire. Rapid, a Nashua-based sheet metal fabrication and machining company owned by Minnesota-based Protolabs, has won The Fabricator Magazine’s 2019 Industry Award. The award recognizes Rapid’s quick-turn production capabilities, its lean manufacturing efforts, and the company’s overall evolution over the past year. Rapid was acquired in 2017 by Protolabs, which has facilities in the U.S., Europe and Japan. Protolabs is continuing to invest into further improving and digitizing Rapid's online-based quoting and fabrication services, according to the February issue of the magazine. Since the acquisition, Rapid is looking to further increase its capacity, automate its processes, and offer an expanded set of capabilities in order to provide its customers with a cost-effective way to source sheet metal components on-demand. Huggins Hospital in Wolfeboro is one of three healthcare facilities to add Fujifilm digital radiography solutions (the other two residing in St. Petersburg, Fl. and Los Angeles, Calif.). The compact, maneuverable design enables radiologists to accommodate tight spaces and neonatal intensive care. Huggins Hospital installed one FDR Go PLUS portable system and one FDR Visionary Suite X-ray room which features automated positioning and optional, advanced applications to improve productivity and efficiency. TechWomen|TechGirls is accepting nominations for TechStudent of the Year, TechTeacher of the Year and TechProfessional of the Year through Thursday, Jan. 31. The winners will be celebrated at the organization's fourth annual awards luncheon, which acknowledges the accomplishments of three women who contribute to the furtherance of STEM (science, technology, engineering and math) education and/or professional STEM advancements for women throughout New Hampshire. Electronic money transfer service, Zelle, announced it has ended the year with $119 billion in payments and 433 million transactions processed in 2018. Among participating institutions is Eastern Bank, which has over 90 branch locations in Massachusetts and southern New Hampshire. "Our mobile banking app provides clients with a secure, convenient P2P solution," said Paul Alexander, chief marketing officer at Eastern Bank in a press release. "Joining the Zelle Network has made it fast and easy to make digital personal payments. By allowing this, we are better meeting the needs of our customers and colleagues." Bulbs.com, an approved LED distributor for six utility programs including Eversource New Hampshire, has a link where commercial and industrial customers can receive instant rebates on their LED lighting purchases. Eligible companies can receive up to $20 in savings per bulb or up to $200 in savings per fixture.